Hello everyone, and welcome to #Day45 of our #DisneyWorldCountdown! 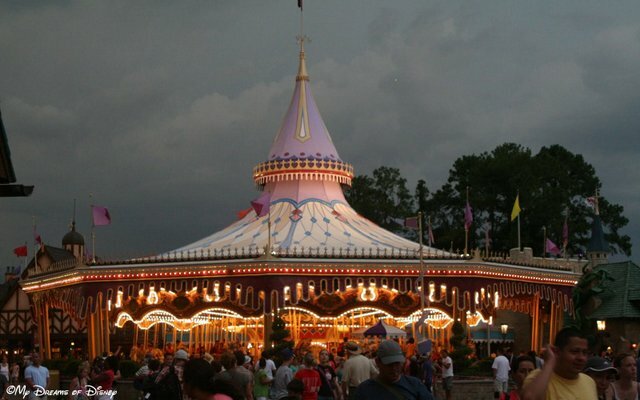 Today, we are taking a look at the Prince Charming Regal Carrousel, that throwback attraction that takes you back in time to the age of carnivals and carousel rides. Prince Charming Regal Carrousel is actually an original Magic Kingdom attraction, and I’ve got a post about it that I wrote on February 4th, 2013. When it first opened, though, it was known as Cinderella’s Golden Carrousel, the name was changed much more recently. My wife and I like the Carrousel very much. It is a simple, relaxing, take-me-back-in-time type of attraction, and while the line is often too long, and the ride too short, it is still something that we like to do once every trip or so. One tip I have for you is that this attraction can be quite easy to get on when it is later at night — and if there has been rain during the day, it can be quite nice and cool too, even in the Florida summer! In fact, it was while we were about to get on the Carrousel that we saw Mickey and Minnie getting onto Dumbo with two special Guests. 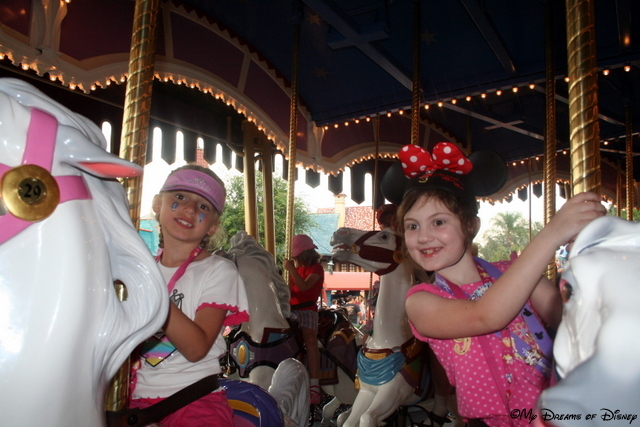 Sophie and Riley ride the Prince Charming Regal Carrousel back in 2008! Back on Sophie’s birthday in 2008, we invited her friend Riley to come with us for the day, and the girls had a great time. That’s why this trip is so special to me — it’s reuniting the girls at Disney, while including Sophie’s new good friend Miss J to the fun we have on our Disney vacations, so this picture is special to me both as I look at the memories from before and look ahead to the new memories we will create in June! My Mom rides on her horse on the Prince Charming Regal Carrousel. 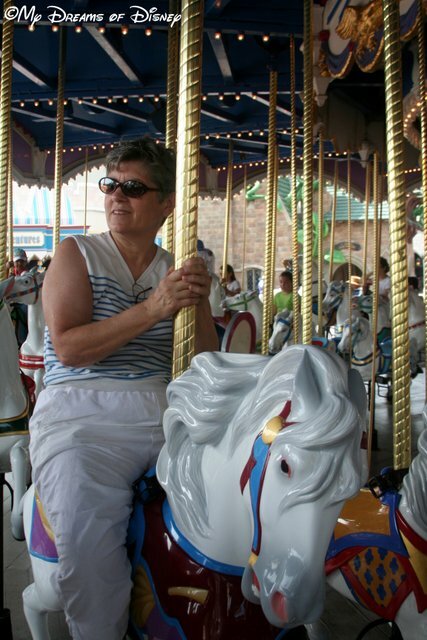 Even my Mom likes the Carrousel — as you can see in this shot from 2006. Today is my Mom and Dad’s 50th Wedding Anniversary, and I am so proud to be their son. I love you Mom and Dad! So tell me, please — the Prince Charming Regal Carrousel, do you ride it, skip it, or something else? Let me know in the comments, and thanks for stopping by!